Sober Look: Germany hurt by the Eurozone's massive demand shock, but has the economy bottomed? Germany hurt by the Eurozone's massive demand shock, but has the economy bottomed? Today's German factory orders came in weaker than expected. Econoday: - Manufacturing orders were much weaker than expected in November. After a marginally smaller revised 3.8 percent jump in October, orders dropped 1.8 percent on the month and on a workday adjusted basis, were 1.0 percent lower on the year. As discussed before, the nation's economy continues to be dragged down by the Eurozone's demand shock. 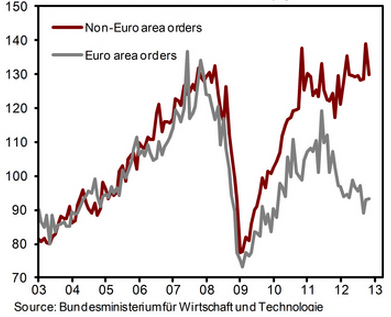 In fact the divergence between the EMU-based orders and orders from the rest of the world has been unprecedented. Going forward, economists are divided over the prospects for growth in Germany's economy. Some are estimating that economic activity in Germany and even that of the Eurozone as a whole may have already bottomed. GS: - ... we expect Q4 to be the trough in this cycle and forecast a (moderate) acceleration [in German economy] at the beginning of next year. 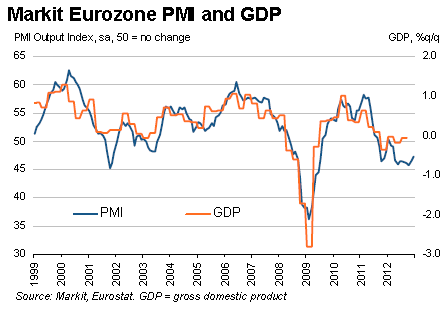 Some economists for example point to the December uptick in the Eurozone PMI. Others see at least another six months of weakness, particularly given high unemployment (which just hit a recent record of 11.8%) and poor consumer sentiment. We should have some early indications of the trajectory later this month when the flash PMI numbers come out. Stay tuned.